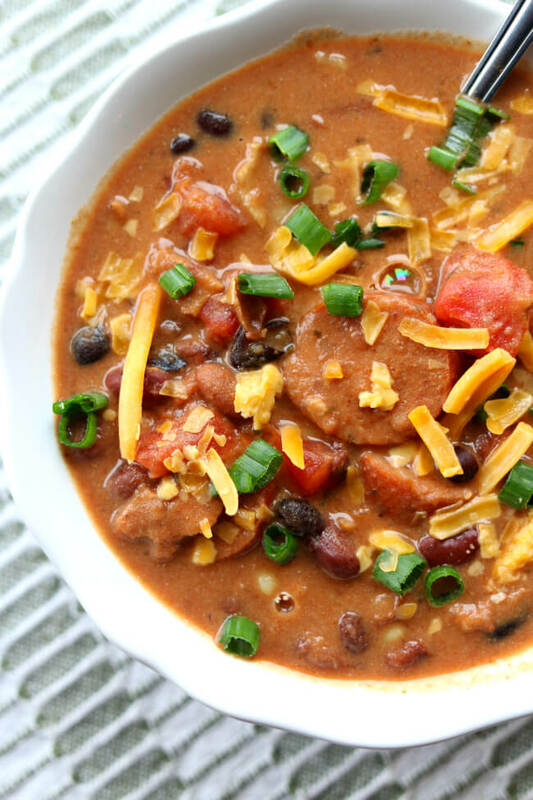 Instant Pot (or Crockpot) Sausage and Bacon Chili Soup–a mix of dried kidney, pinto and black beans cooked in your pressure cooker with onion and chili seasonings. Then a generous amount of sliced sausage and crispy, crumbled bacon and sour cream are added to make it a creamy and comforting soup that you won’t be able to resist. Today was snowy. Last week it almost got up to 80º F. It’s that weird time of year when anything can happen with the weather. 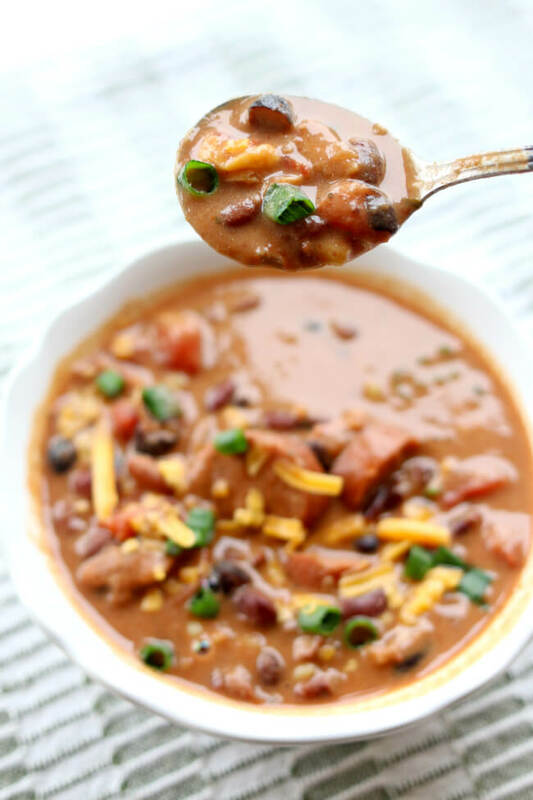 I was secretly excited when my heater kicked on and it was cloudy and gray because it meant I could make this Instant Pot Sausage and Bacon Chili Soup! 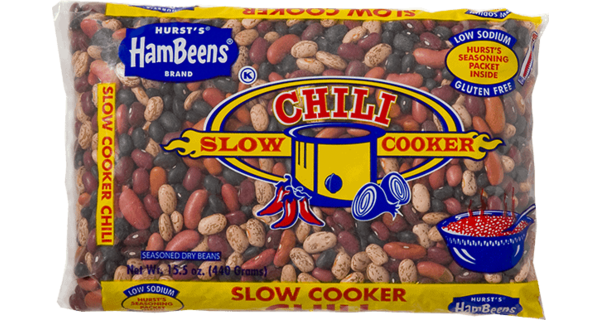 I have been itching to make my favorite dried beans, Hurst’s, in the Instant Pot. Usually I soak them overnight and then cook them in my slow cooker and they turn out wonderfully. However, I wondered how the pressure cooker would work when I’m in a pinch for time. I also wanted to know how it would work if I did the “soaking” in the Instant Pot. I read a bunch of stuff online and found out you can do a quick soak in the pressure cooker by adding water and dried beans to the pot and then cooking for 2 minutes and then gently letting out the pressure. I did just that and then rinsed and drained the beans and they were “soaked” beans ready to go and be used in this soup. Game changer for people like me who always seem to forget to soak the beans the night before. 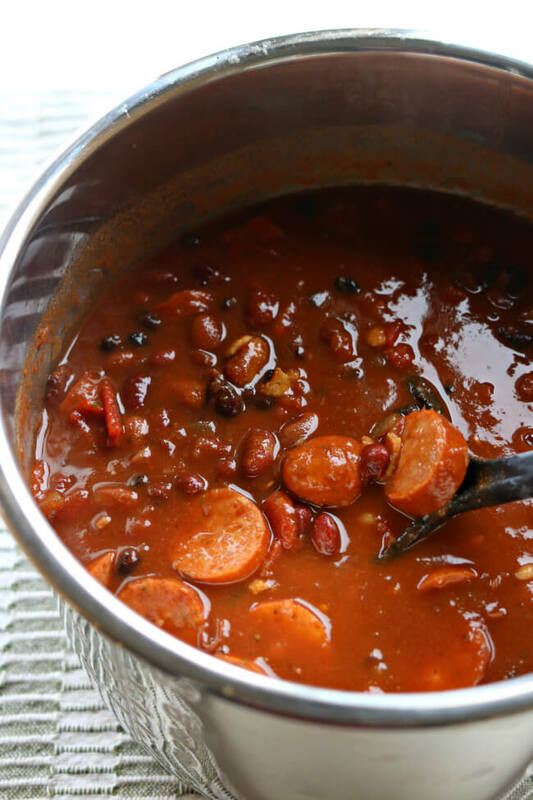 For this recipe I decided to use “Hurst’s Slow Cooker Chili.” This product has dried kidney, pinto and black beans in it as well as a seasoning packet that has all the amazing flavors that you love. For me, this was the perfect addition. Seriously this soup is the perfect thing to eat on a day like today. It totally hit the spot. And this recipe makes quite a bit so if you’re not feeding a crowd you can portion the leftovers in individual containers and eat them for lunch. If you wanted to freeze them I think it would work really well without the sour cream added. I’m not really a fan of frozen dairy because it always seems to come out separated and weird so maybe don’t try that. 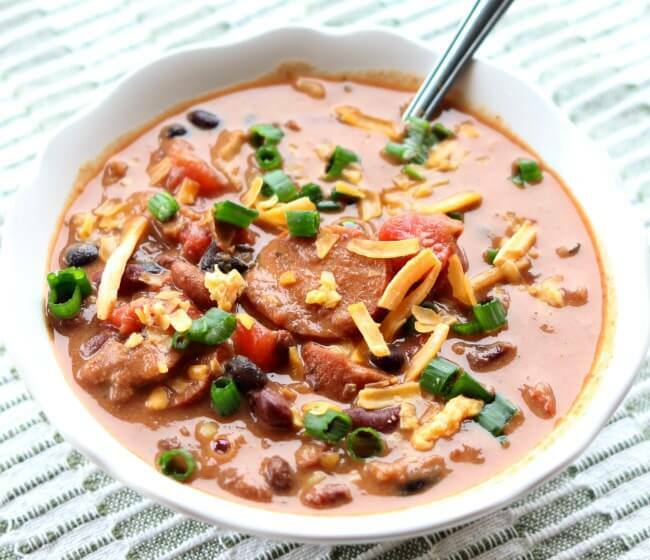 For this Instant Pot/Crockpot Sausage and Bacon Chili Soup recipe I used this Instant Pot IP-LUX60 V3 Programmable Electric Pressure Cooker. It’s 6 quarts, so the same size as most slow cookers. It cost me around $80 on Amazon. Open package of beans and set aside the seasoning packet for later. Rinse off the beans in a colander. Then add the beans to the pressure cooker (**or slow cooker). Turn valve to sealing. Add in 1 Tbsp of salt. Add in enough water to cover the beans by a couple of inches. Place lid on Instant Pot and cook for 2 minutes on the manual setting. When the timer beeps let the beans sit for 10 more minutes. Then release the rest of the pressure by turning the valve from sealing to venting. Remove the lid and pour beans into colander and rinse off. Add beans back into empty Instant Pot. Add in 5 cups of water, diced onion, minced garlic and half of the seasoning packet. Cover the pressure cooker and set the valve to sealing. Set the timer on manual to 23 minutes. When the timer beeps let the pressure release naturally for 10 minutes and then open the valve to venting and let the rest of the pressure out. Add in the sausage, bacon, diced tomatoes, and tomato paste. Stir. If desired add in the sour cream. Add kosher salt to taste. Ladle into bowls and serve with grated cheddar and green onions, if desired. 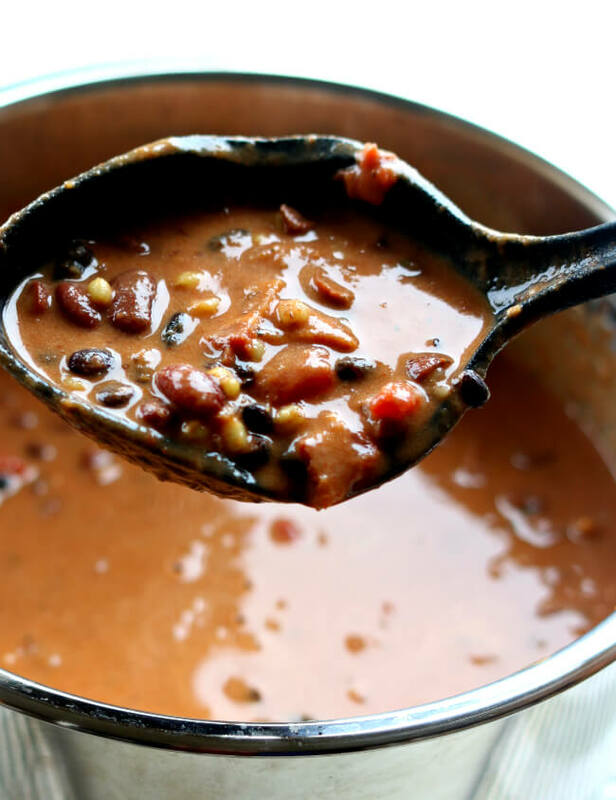 **To cook in the slow cooker soak the beans overnight with plenty of water and 1 Tbsp of salt. Rinse and drain the beans and add them to the slow cooker along with 5 cups water, onion, garlic and half of the seasoning packet. Cover and cook on low for 8 hours or on high for 5 hours, or until beans are tender. Add in sausage, bacon, tomatoes and tomato paste. Add in sour cream, if desired. Salt to taste. Ladle and serve.